Following a visit to Cowbridge we are pleased to report that the following shops have kindly agreed to display our quilts in their shop windows from 2 – 16 November 2015. 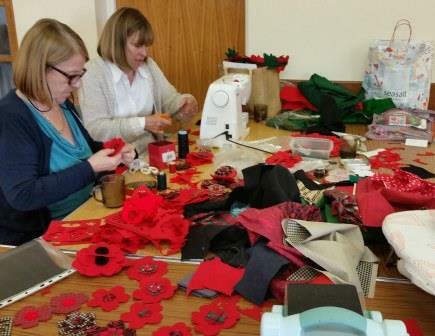 Liz Price started to make felt poppies to display alongside the quilts when they are exhibited and was grateful to a number of members who rallied round to help. We were grateful for the huge support given by Julie williams, Manager of Ty Hafan shop who was keen to paint the town red next year! British Legion were also pleased with the impact that our efforts had had on their fundraising. “Just thought I would drop you a quick update on this year’s Poppy Appeal as I am sure your ladies contributed to our success. The Poppy Appeal as a whole has been brilliant for the Cowbridge area this year, which explains our being a little later than usual getting information out. The street collection plus that from schools, shops, businesses, pubs etc increased by 20% over that of last year raising a total of almost £13,500. Our total including money from other sources is already in excess of £16,000 and is destined to top £17,000; a record amount. I would be grateful if you could pass on my sincere thanks and best wishes also to all for Christmas and the New Year. I hope we can continue to work together on future Poppy Appeals“.